BREAKING WIND: Tim Yarker of the No Slyers Lane Turbines, who says the 370ft six wind turbine development at Charminster will devastate the landscape and effect the qualify of life for local residents within the vicinity of it. 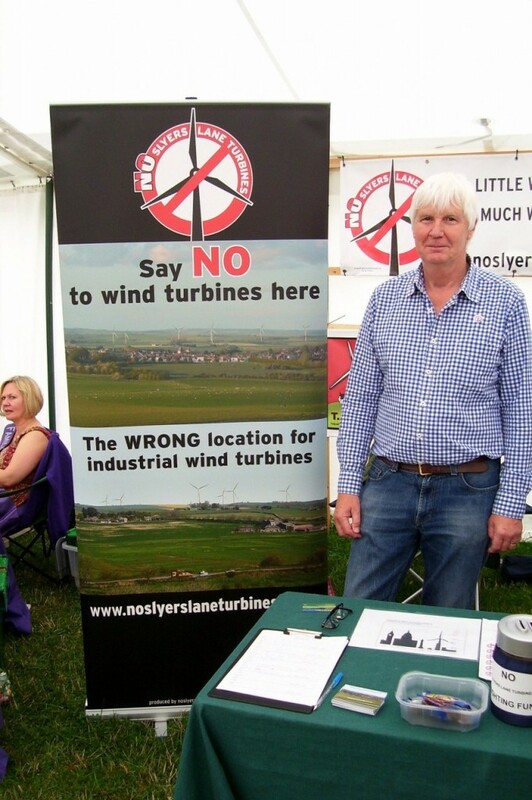 Mr Yander is at the No Sylers Lane Turbines stand at the Dorchester Show earlier this month. 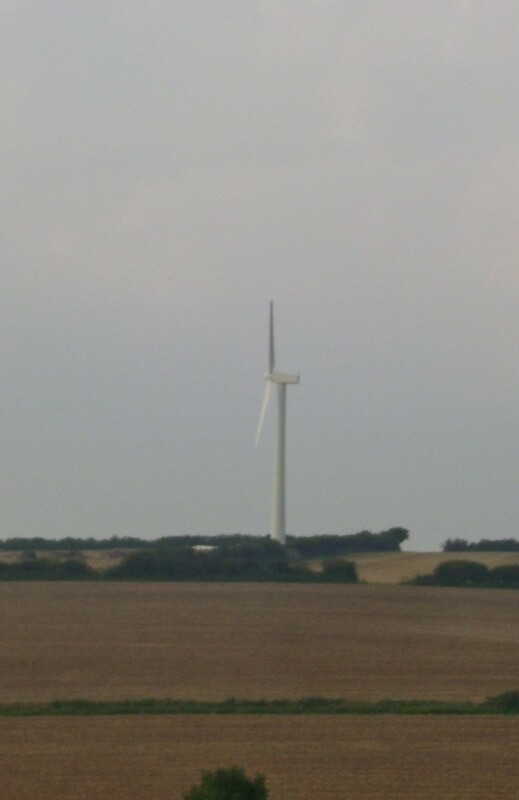 STANDING STILL: This wind turbine, can be seen from a lay by near the turning off to Tolpuddle off the A35. Protesters say turbines like this will produce little energy if there is not enough wind whilst supporters of the development say advances in technology mitigates this problem. PROTESTERS in central Dorset are galvanizing support to stop giant wind turbines being cited in their community and ruining their quality of life. Tolpuddle Against Industrial Wind Turbines and No Slyers Lane Turbines were asking residents with concerns to write to West Dorset District Council about Broadview Energy Limited’s plans for five giant wind turbines at Afpuddle and they were engaging visitors at this year’s Dorset County Show. The protesters say the wind turbines will be up to 115 metres (377 ft) and will be visible as far away as Poole. They also claim the turbines will dominate the skyline of the county town of Dorchester, the iconic Poundbury development, Charlton Down, Charminster, Frome Whitfield, Stinsford and Higher Bockenhampton. TAINT claims the current proposals would lead to the Area of Outstanding Natural Beauty where the two villages reside being desecrated and damage to the culture and heritage of the area, which is the setting of listed buildings and Thomas Hardy country. Other arguments include impact on the local economy and social amenities such as the use of footpaths and bridleways and the destruction and disturbance of archaeological remains and scheduled monuments. However Broadview Energy Ltd says this wind farm development “could make a valuable contribution towards increasing the UK’s energy security and reducing carbon transmissions”. 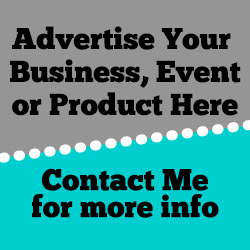 Following consultations with groups such as English Heritage and Natural England a series of local exhibitions for residents between October 2013 and May of this year, the final design was made. This proposal fulfils their criteria of maximizing the next generation of renewable energy and being sensitive to the needs of the local environment. According to the website of No Slyers Lane Turbines, they do have the support of all three MPs within the immediate locality – Oliver Letwin, whose constituency the wind turbines are being proposed; South Dorset MP Richard Drax and North Dorset MP Robert Walter. There will be a “cumulate effect”, they say as there are two other proposed wind farms at Charminster, near Dorchester and Winterborne Whitechurch with existing developments at Roger’s Hill, Bere Regis and the recently approved Alaska wind farm near Wareham. The group insists that Dorset has achieved 98% of its 2020 renewable energy targets and does not need these industrial turbines. They are inefficient and only operate at 23 per cent capacity on average. Spokesman Tim Yarker said: “They say they can supply 90 per cent of the renewable needs for Dorchester but it wouldn’t be working most of the time. Sometimes it will produce too much and when it does not work, it will produce little energy. They will be 115 metres above the landscape. “The developer applied for a test mast in September 2013 and then we convened a village meeting in November attended by a 100 people and from that we founded No Slyers Lane Turbines. “Broadview originally applied for seven turbines of 125 metres but after some publicity they came back in March of this year and reduced the number of turbines to six and the height to 115 metres – this is taller than St Paul’s Cathedral. In a post put up in support of the development on the Dorset Energized website, Eric Blaikley, formerly of Ilkley, said that four giant turbines that served the Yorkshire Dales were taken down last year as they had served their operational time span and hinted that the turbines at Slyers Lane have a fixed shelf life and the countryside would be returned to what is now after they are developed. “What does this actually mean? Well first and foremost it proves that wind turbines do not permanently despoil the landscape. It is easy to take them down, recycle much of the materials in them and return the landscape to the form it was before they were built so the idea that wind turbines permanently despoil the landscape is rubbish. Global warming is more dangerous than landscape changed. Actually those farmers saying that are protecting the landscape is like a joke. All the farm land is an artificially and highly modified landscape by the human action. Farms are not natural at all.